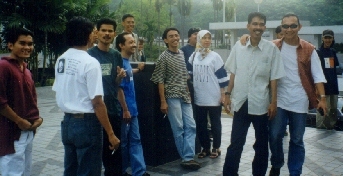 #kampung, is one of the largest channels in the Undernet among Malaysians, mostly among Malays. 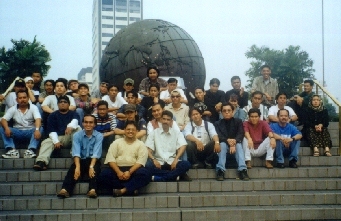 We organized a gathering on 7th September 1997, but the turnout was quite small, considering the channel size. However, the gathering went along quite well. It was held at an Indian restaurant in Dayabumi Complex, Kuala Lumpur. It was dissapointing that not many girls showed up, but we appreciate the presence of those who made it. Maybe next time this gathering would be more successful, perhaps a better venue which would attract more people. Above is a pic of all of those who attended. The organisers would very much would like to thank them for coming. Below is a pic of some of the organisers and/or channel regulars/operators. Nicks of which are Jelpudu, Mukabuyuk, G-Childz, Lepaque, Alikutek, Heikal and Warezweza.